A 4-year old boy fell into gorilla enclosure in Cincinnati Zoo. 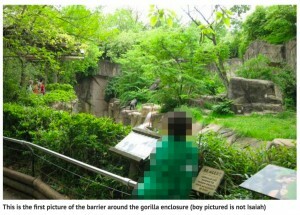 One of the gorilla dragged the boy around and showed clear potential to endanger the boy’s safety. The zoo made a tough choice to shoot the animal. Then the world reacted very strongly. If you haven’t heard about this news, I suggest reading this article first. Let’s start with the basic. This species of gorilla is considered rare and endangered. So naturally they need to be protected. However, an animal’s life vs. a human child’s, I would clearly make the same choice any day. Clearly, a lot of people has very different reactions and apparently mine is the unpopular one. From a quick reading in social media, I frequently spotted people commenting that they should have shot the boy’s mother instead. Excuse me? These people are suggesting that once they disagree with a human, or once a human makes mistake, then the value of his/her life is less than animal??? This is beyond my comprehension. The boy’s mother was distracted. That’s clearly a mistake, yes. But it’s not a mistake that deserves any parent to lose a child. I can still understand the call to bring some consequence to her, but obviously her mistake is far from anything that deserves death penalty. 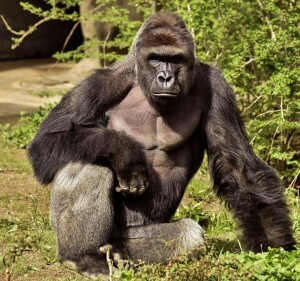 Why shot the gorilla instead of using tranquilizer? First, tranquilizer is not always readily available. Two, for instant unconsciousness, the dosage needs to be calculated based on the animal’s weight. Three, if tranquilizer shot fail to instantly render the animal unconscious, the next few seconds after the shot would be extremely dangerous for the boy. Anyone would feel agitated if being shot from afar, yet can still move for a while. Another argument: the gorilla was trying to protect the boy. This is a super delusional argument. In rare case, we did see some videos of wild animals protecting humans. However, it’s not the default behavior for many species and there’s never any guarantee that it will happen. Those YouTube videos of animals protecting humans are popular BECAUSE it’s not what usually happens. And don’t even bring Hollywood movies here because in case you haven’t realised: they’re fake (staged or digitally animated). The vast majority of the time, animals will harm other species when they feel threatened, or agitated. This particular gorilla dragged the boy around, threw the child and can fatally would the boy at any time. Looked clearly agitated to me. Especially that he’s the only one not following the zookeepers’s instruction to stay away (other gorilla in the enclosure obeyed and was not harmed). It’s an ANIMAL, people. Just because we see a lot of fictional characters of kind hearted animals, doesn’t mean the real ones would actually behave the same way. There IS a possibility, but in any given time, it’s NEVER worth to gamble with a human boy’s life at stake. 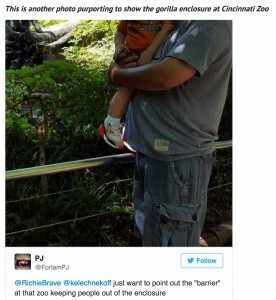 Let’s say Harambe might not intentionally trying to harm the child, but clearly what is safe for gorilla baby is different from what is safe for human child. The video clearly shows the child being dragged around, and eyewitness mentioned that the boy was thrown in the air at some point. This article says it’s a “normal” gorilla play. Regardless he might have good intention or just playing, his action still could severely endanger the boy. Other animal defender says that gorillas don’t attack. Well, it does NOT need to attack the boy. When its normal play can already harm the boy, the choice can’t be any clearer. I wonder would these keyboard warriors make the same comment if the child in danger is their own child, or someone they personally know? I am all for protecting endangered animals. We should. However, NEVER at a cost of human safety, let alone a child! Then who is at fault? To me, the biggest problem lies on the zoo who created an enclosure for endangered animals without proper safety barrier both for the animals and visitors. The barrier is around 3 foot, very easy for kids to climb. Have a look at the picture, it even has something for kids to step on. Yes, it is true that the most sophisticated security system is still breakable by dedicated thieves. However, having a decent security is much better than having half-assed security. At the very least, proper security measures should prevent most casual incidents coming from children and adults with children mentality. Again, not saying that the boy’s mom is not wrong, but her mistake doesn’t deserve losing her child. From my view, the boy’s mom did a mistake but not a severe one that should cost any human life. The zookeeper made the right call by shooting the gorilla to death. If I were in their positions I will take the same action. Repeat 10 times and my decision would still be the same. Even when the animal is the only one left of its species on this planet, against potential danger of human life, I would choose to end the animal’s life at any given time. Some other social media commenters pridefully condemn the very existence of human beings as the “source of every destruction” on the planet. Really? If being human is so bad for him, he is more than welcome to end being human. In other news, thousands of other cases of trophy hunters killing endangered animals for fun (who are not threatening any human) are not given nearly enough attention compared to this one. Sorry, but this is beyond my comprehension, it seems that so many people are so eager to see someone from fellow human being being harmed instead? I wonder if most of these keyboard warriors who sent death threats to the boy’s mother actually did something to help protecting those endangered animals (who are not endangering human child’s life) from poachers and trophy hunters. Here are some good readings: Poaching Statistics, Poaching Infographic and Wiki page on trophy hunting. In other news, those idiot parents from Japan who left his child in a forest full of bears as punishment don’t get nearly the same hate rage as a mom who lost control of her child for few minutes. Any parent who can always fully control their toddler/kinder children and never lost a single second, please step ahead. I’d like to learn from you, oh wise masters. Every living beings on this planet will always defend and protect their own kind first at any perceived danger before caring about other species. The condition is clearly non ideal. But channeling our anger at the wrong target while doing very little for the ones who actually deserve our help more is not going to make the situation any better. as creatures that are ruling over flora and fauna and, it seems, the whole planet, we do have the audacity to say that a human life is valued above and beyond the life of any animal, endangered or not. .
100 years ago this child would have been a goner. mommy would have cried. oh well, tough Scheisse – wouldn’t have had anyone to blame but your own sorry self. maybe in another 100 years gorillas and other animals will break out of the captivity, invent their own powerful weapons and avenge every one of their little ones that get eaten as a steak, killed for the shear pleasure of hunting, or strung up for their pretty skin.